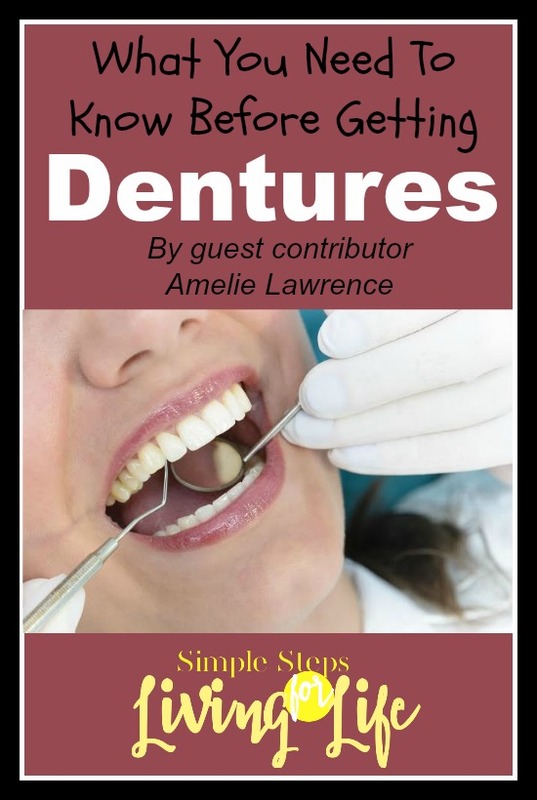 Thanks so much to guest contributor Amelie Lawrence for this article about dentures. As a person with bad teeth and a family history with people needing dentures, I’m happy to add this to Simple Steps For Living Life’s Health & Beauty section. Are you suffering from teeth problems? Then you may need to replace your natural teeth with high quality dentures. There is a choice of partial dentures or full dentures setting for your teeth depending on your circumstances. With these new chompers you can easily eat, chew and smile with confidence. Dentures are just a look alike of your original teeth. Partial dentures are available with removable plates which can be used to replace the missing teeth. If you need to replace your full teeth set, then full dentures will be required. How Do You Get Used To Wearing The Dentures? When you wear the denture, it will take some time to suit you because this is an artificial tooth and when you implant some false teeth with your natural existing teeth, it can create some irritation and friction. 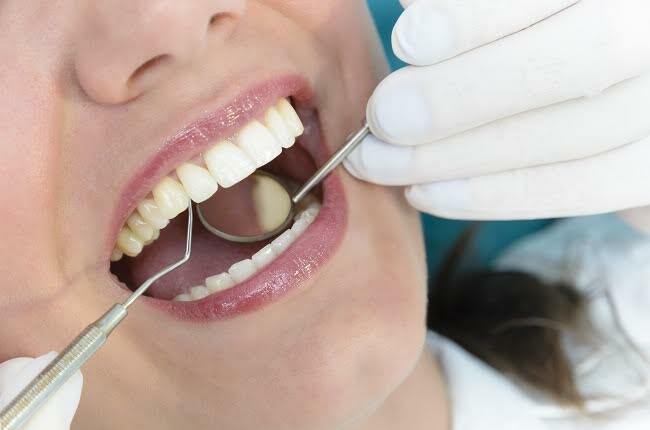 To avoid these problems, you need to consult with a reputed and certified denture clinic and they will fix the high-quality denture specifically for your mouth. However, some full replacement of the natural teeth with denture might make you uncomfortable, and you may suffer from some serious irritation by wearing the full denture the first time. When first putting the dentures in your mouth, you need to move your mouth, tongue and jaw all the time. Some dentures require a dental adhesive product that is applied to the part of the denture that will rest on your gums and is replaced often. Try bitting down on the dentures to adhere them to your gum. If you stay still and do not move the mouth then the dentures cannot fix with your gum properly. Try to chew some gum after wearing a denture and to make it more comfortable. Chewing a gum can provide some saliva to the denture. It can help you become accustom to the denture by chewing the gums on a regular basis. You may face some speech problems when trying to pronounce words and speak normally with the false teeth. Try standing in front of a mirror and talking to practice speaking alone. It will help you to be able to see if your mouth moves differently with the dentures and adjust accordingly. Speaking problems will be solved quickly and it only needs some practice. It is suggested to only eat soft food when you wear dentures because for the first few days you cannot eat and chew hard foods easily. Try to avoid dinner parties for the first few days until you can practice eating different foods.. When sleeping, it’s best to remove and store your dentures after washing it with the proper solutions. However, for the first few days you may sleep wearing the denture because it can easily get fixed on to your gum during the night. Why Do You Need To Keep In Touch With Your Denture Clinic? Dentures do not provide the same strength as your natural teeth and it is just like a prosthetic part of your body. You can use a partial denture or you can also go for full teeth replacement. However, it will take some time to adjust the dentures with your mouth, and you need to practice eating and moving your jaws as per the dentist’s suggestion. You have to go through a long process and it may take several appointments to make sure the denture fits in a proper way. Some people suffer from gum problems, bone loss, nerve problems, irritation and scar tissues after wearing dentures and to resolve these problems you need to talk to your dentist at the denture office frequently. Also it is important to keep in appointments with your dentist to keep your warranty current if one if offered. Every individual is different and people have different oral structure. Therefore, it depends on your gum and teeth setting how much time you will require for setting a denture. So always consult with a certified dentist at a professional denture clinic in this regard, and follow all of their directions to maintain better oral health. Great article! Dentures are ideal substitutes for missing teeth. Dentures have been a big solution for a lot of people for a long time, however, this form of treatment is not always the best. Denture implants are a relatively new idea for securing lower dentures. Thanks for sharing such an informative post and I really appreciate this one. This is some really good information about getting dentures. That is a good thing for me to know that it would be smart to make sure that the dentures will work with your existing teeth. It might also be smart to think about if you want to get the rest of your teeth pulled. I’d highly recommend Royal Dental in Pearland, Texas if you want a great experience. I had my dentures done there, and it was extremely easy. The price wasn’t too bad either. I had recently received a dentures treatment from my dentist in Instyle Dental Group in Houston, TX and I think if I’d have found our article earlier, I wouldn’t have looked so stupid asking so many questions to the dentist. Haha. I got myself dentures from Hillcrest Dental Arts in San Diego, CA recently and I am thankful to you for sharing this article – how I wish I’d have seen it before taking the decision – not that I regret it but just to get more info in your head before getting them would be better always. Hi, I really impressed by your knowledge and your article was so informative. As a dentist, I just want to say that everyone should know about all these things before getting any dental treatment. This is some useful information! Thanks so much! Dental Health Centre in Ontario has been keeping my family very educated on dentures, too as my father is going to need them soon! Well, I recently had a partial denture from Sinclair Smiles in Encinitas, CA and I am kinda looking at every possible article there is about dentures. Your article has given some great useful tips – thanks a lot! Going to the dentist is always a tough task but whenever I am scheduled for a visit, out of nervousness, I keep visiting blogs like yours just to help myself get prepped for the visit. This time, I’m headed to the Wyndam Dental Care in Ajax, ON – my parents’ family dentistry. And I am glad to see a helpful post like this one – it helps a lot before a visit. Thanks a lot! Thanks a lot for your tips. I am pretty nervous about getting dentures as I am scheduled to get them next week at the Burnaby Dental, BC. Your article will prove to be of great help. My dentist near me at Katy Dental Experts proudly offers both full and partial dentures. He covered all of this and more during my free consultation in Katy, TX. Even if you’re not a big fan of pursuing dentures as a tooth replacement option, my dentist in Houston, Dr. Jeff Lewis, mentioned dental implants or bridges as an alternative for tooth replacement. I got dentures from my dentist at Katy Dental Experts a few years back. Probably the best thing that ever happened after losing most of my teeth! Our family dentist in Richmond was very informative about it when my parents were getting dentures. He did a great job! Thanks for post and time the most interesting part of this article was what you need to know before getting dentures. I’m so thankful that my dentist in Alpharetta discussed all of the pros and cons of dentures with me before my final decision, I opted for implant supported dentures, I don’t need any adhesives and I never have to worry about my “teeth” falling out. I absolutely love and recommend implant supported dentures if your dentist offers them! Richard Morrison recently posted…What is Dental Bonding? They are great! My dad just had the implants put in last year and it’s made such a great difference. My wife and I have been talking to her mom about some dental options, and one thing she’s been considering is dentures. I’m glad that you talked about dentures, and offered some new information I wasn’t aware of, like chewing gum after getting dentures being good to help make them more comfortable. I’m going to have to remember that when my mother-in-law gets dentures and hopefully it’ll help her out! Thanks for the tip! It takes some time to get used to wearing dentures, but they can make the world of difference to your quality of life. They have come a long way in recent years, and it is hard to tell that you are wearing them. As a dental you might be wondering about getting the dentures. Replacement of lost teeth is a quite expensive procedure. Most of the dentures can be installed within an hour. It gives you an attractive smile. Therefore for the sake of impressive smile you should not hesitate.